Our domain service are new domain registration, domain renewal, free domain name transfer and domain name forwarding, The features includes FREE DNS service, FREE Privacy Protection, FREE domain management tool, domain renwal remainder, Free domain name transfer, reseller hosting, web designing, web hosting, website design, logo design, flash banners design, domain registration packages, web designing packages, reseller hosting packages. Our domain service are new domain name registration, domain name renewal, free domain name transfer & domain name forwarding, The features includes FREE DNS service, FREE Privacy Protection, FREE domain management tool, domain renwal remainder, Free domain name transfer, Guard your domain name against unauthorised domain name transfer or domain name theft protection by locking & unlocking, change name server, ip address or child name at anytime & access all your domain name from single domain control panel, Geohoster also provides domain registration, domain name registration, domain registration in coimbatore, domain name registration in coimbatore, domain registration in coimbatore, domain name registration in coimbatore, domain renewal. Whether you are getting started with your first website or a freelancer or a web designing company, you'll appreciate the speed and features we offer with our web hosting plans. Manage all aspects of your web hosting from one easy to use cPanel or plesk Web Hosting Control Panel, Our website hosting solutions are targeted to small to medium to huge business sector for the world www market. As of now we provide shared linux web hosting space, shared windows web hosting space & Reseller linux web hosting at 50% discount for first year back end excellent support, guaranteed uptime, high end server & no question asked money back guarantee. Our linux package comes with cPanel & windows package comes with Plesk. Geohoster provides web hosting in coimbatore, web space hosting, web hosting in coimbatore, web hosting, hosting in coimbatore, hosting, hosting in coimbatore. Do you want to offer web hosting space or do you want to run multiple sites in a single control panel or do you want to start a web hosting company that you'd like to host in a cost effective manner? Our reseller web hosting plans, featuring WHM/cPanel, are just what you are looking for, It gives you flexibility to host unlimited domains and customer accounts in a single WHM control panel. Each of your customer will get seperate cPanel admin area for managing there own site. Our reseller service includes linux reseller package, cPanel & whm reseller hosting.Geohoster provides reseller hosting in coimbatore, reseller hosting, reseller hosting in coimbatore, reseller hostings,reseller hostings in coimbatore, reseller hostings, reseller hostings in coimbatore. Start your own domain reseller program for free of cost, just sign up the form, All our reseller domain name pricing is applicable for everyone who wants to register the domain name for web development business segments. Our domain reseller program features includes private labelled domain registration with seperate domain management API tool for your customers & reseller, industries lowest pricing, readymade website, free domain API tool, All domain names are registered under white labeled Registrar. Your Customers and Resellers cannot buy from our white labeled registrar directly, sales & marketing automation, manages transaction & invoicing automatically. Our priority is to build websites that make money for our customers, enabling them to obtain more customers or to provide instant information to potential clients. A professional appearance is important but the first priority is that your new website generates a positive cash return for your business.We build all sorts of web sites for all sorts of budgets. We will help you through the process of determining what style of site and what kind of content will suit your business.Geohoster provides web designing, website designing, web design, website design, web designing in coimbatore, website design & development in coimbatore, website design in coimbatore, web design in coimbatore, website design in coimbatore, web designing in coimbatore. 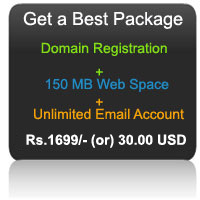 Our website designing package starts from Rs 3999/- (or) US$ 75 .